Leiden postdoc Lucia Bossoni and former QN/Delft (now SRON) postdoc Pieter de Visser received a NWO Veni grant. Read more about their research in the below. Abnormal accumulation of iron is found in the brains of patients suffering from several different neurodegenerative diseases, but its potential toxicity is still not understood. This research uses a new multidisciplinary approach to detect and characterize different forms of iron, also leading to new in vivo methods of visualization. SRON researcher Pieter de Visser will receive a 250.000 euro Veni grant from NWO to develop a novel detector for the study of exoplanets and the presence of life or life's building blocks on them. The detector will be very sensitive and efficient: each photon coming from a very faint, Earth-like, exoplanet will be detected. Simultaneously its energy is measured. The latter allows astronomers to make a spectrum of the atmosphere of the exoplanet. Such a spectrum can show the molecular lines related to life. 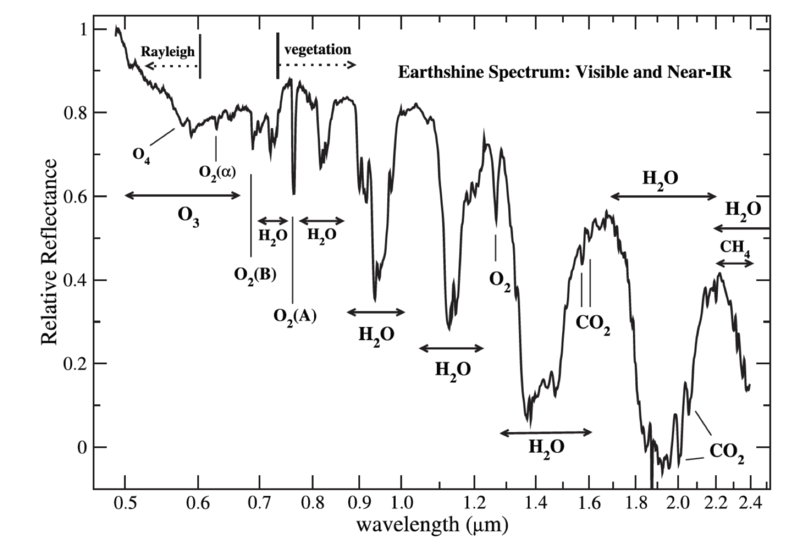 A calculated spectrum of an Earth-like exoplanet with lines that are tracers for life: water, oxygen, carbon-dioxide, methane. The search for life on exoplanets is one of the most important goals for astronomy in the coming decades. After finding many thousands of exoplanets, large and small, hot and cold, gaseous or rocky, we have realised that our solar system is not typical and we are forced to reinvent planet formation models. Quite a few planets have been found in the habitable zone of their star and therefore the question whether there is life on them is pressing. The answer appears in reach for the first time in human history. The research of Pieter de Visser will lay the foundation for future instruments in space that will search for Earth-like exoplanets. Observing an Earth-like exoplanet will be a true challenge as it orbits a parent star that is 10 billion times brighter than the planet. De Visser will base his work on superconducting detectors that are truly noiseless and should ultimately have an intrinsic energy resolving power of 70 to acquire the spectrum of the atmosphere of the exoplanet. It is for the first time that such an instrument, a so-called Integral Field Spectrograph (IFS), will be developed for visible light, and with these specifications. Essentially, the IFS is a supersensitive camera that can make colour images without requiring dispersive optics. Since imaging and spectroscopy are combined, the final instrument can be of high throughput and may have a simplified design. During the Veni research Pieter de Visser plans to (i) develop a single pixel with a resolving power of 20, (ii) make an array with 2000 pixels and a resolving power of 20, and (iii) push the resolving power to 70 for a small array. The 2000 pixel array in the second objective will demonstrate the potential of the novel technology in the lab. The resolving power of 20 is more than sufficient to enable demonstrators for fringe tracking and wavefront sensors for ground-based astronomy. The third objective is the most challenging and will probably require deeper understanding of the microscopic physics of disordered superconductors. A century of bacteriophage studies has resulted in the development of molecular biology and many genetic tools. However, phages themselves remain obscure entities. This research will address fundamental questions regarding recombination and exchange of genetic information between species, and will develop a platform for phage tailoring for bacterial control purposes.